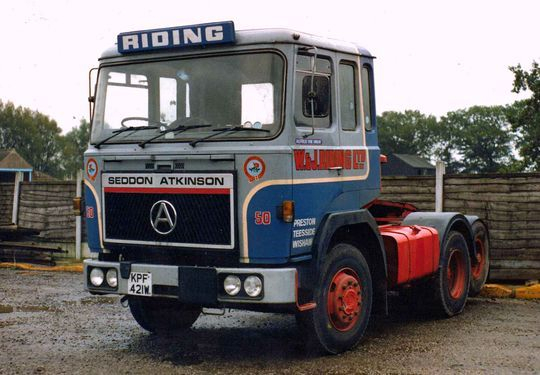 Seddon Atkinson 400 Series 6x2 tractor unit Reg No KPF 421W Fleet No 50 was unique in being the one and only three axled tractor unit that W & J Riding operated while Tom Riding was managing director of the company. 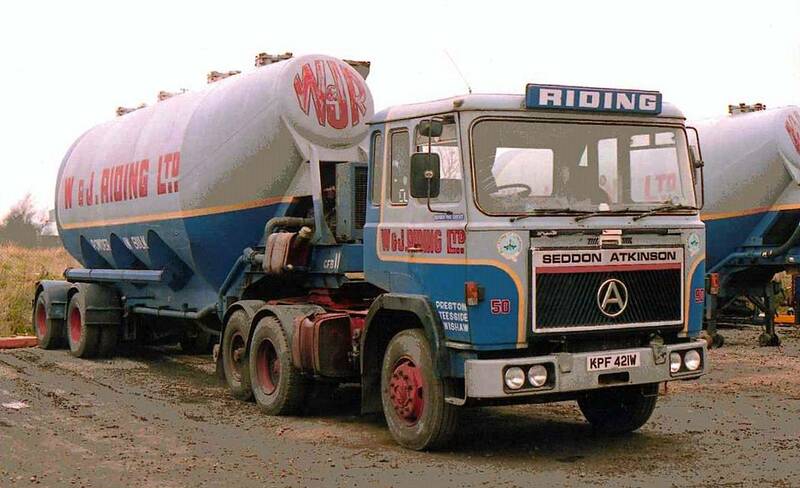 Named 'Alfred the Great' and powered by Cummins E290 engine it was used on a regular basis pulling a tandem axle tipping trailer at 38 tons GVW. 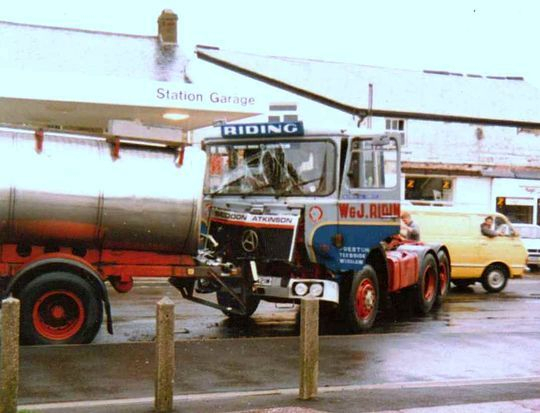 Registered new on the 1st of August 1980 KPF 421W is seen here in its original form when operated by Ifield Transport of Sussex. Riding's purchased it second hand when three years old from Yardley of Kidderminster for £9,400 plus vat on the 7th of August 1983. 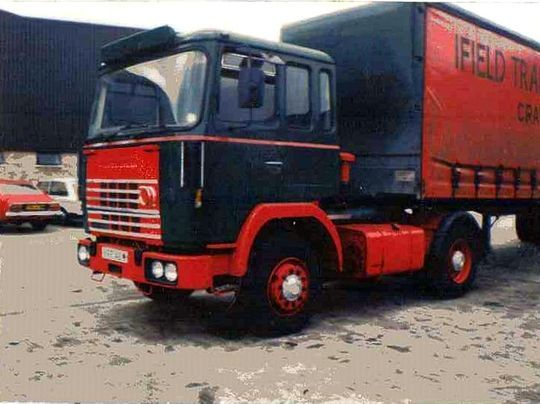 In October 1984 KPF 421W was fitted with a Norde bogie which cost £3,270 plus vat. Converted by R J & I Wells they also fitted a Norde bogie to one of their own Sed Atkis at the same time. 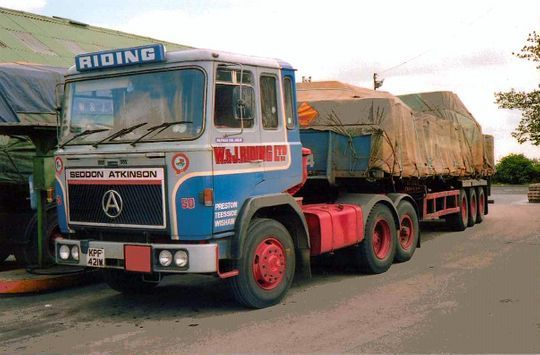 Powered by Cummins E290 engine KPF 421W was later used on a regular basis pulling a tandem axle tipping trailer at 38 tons GVW. 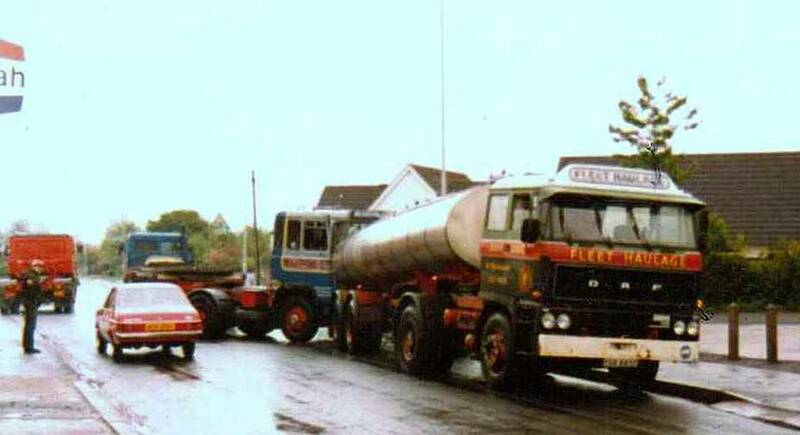 In later life KPF 421W came to grief in the wet when it ran into the rear of a Fleet Haulage tanker when travelling unit only at Grimsargh about 3 miles from the depot at Longridge. After the accident it was rebuilt using the cab from Seddon Atkinson 400 Series Reg No UJP 758S Fleet No 79 'Hardwicke' which had been scrapped in June 1986. Another shot of KPF 421W came to grief in the wet when it ran into the rear of a Fleet Haulage tanker when travelling unit only through the village of Grimsargh Lancashire. Seen here parked in Longridge depot after six years service with Riding's KPF 421W was eventually sold to John Killingbeck of Blackburn on the 1st of August 1989 for £2,700 plus vat where it started its third life.